Should School-Issued Digital Devices Be Taken Home? 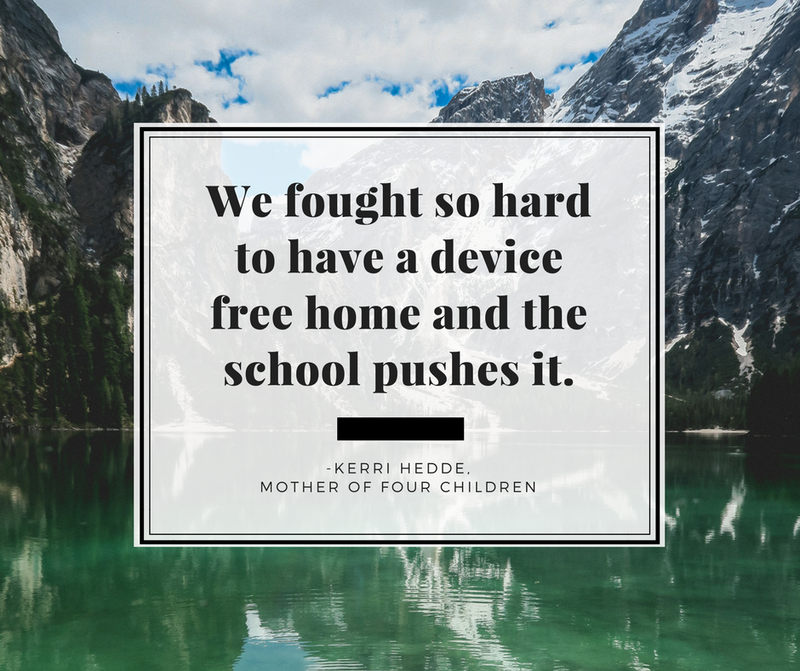 Should schools with 1:1 digital devices allow students to bring home their devices nightly? I have been thinking about this question and writing this post for a long time. I have been pondering this from multiple perspectives, as a school library media specialist, teacher, parent, andstudent. 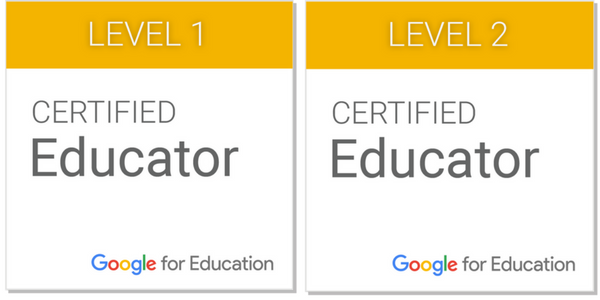 We live in a digital world and we need to prepare students for that world. I absolutely believe in providing devices so that each student has access at the point of need. With devices, educators can teach students about digital research, search strategies, reliable sources, and triangulating information. 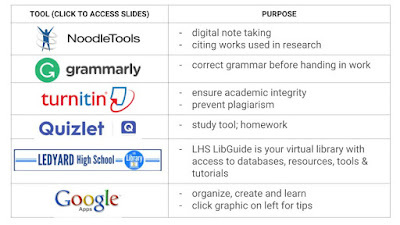 With devices, educators can teach students about library databases and finding information beyond Google search results. With devices, educators can teach about copyright, plagiarism, and Creative Commons. With devices, educators can teach digital note-taking and citation. With devices, educators can teach students how to collaborate digitally and how to use a variety of digital tools, allowing differentiated options for students to show learning. With devices, educators can teach students how to be a part of the digital community, to protect themselves, to use social media positively, and to protect their digital footprint. Librarians and teachers TEACH all of those skills. However, before 1:1 students did not always have the chance to practice and skills immediately, making the teaching meaningful. Individual devices provide students with the opportunity to use what they are learning as they are being taught. With educators close by for guidance and assistance, students have the can ask questions, create and explore. The key is here is that the teacher or librarian is present to guide, help and monitor students as they dive in to the digital world. I do not know that handing each student their own device to tote between home and school each day makes the device an effective tool, at least not before high school. 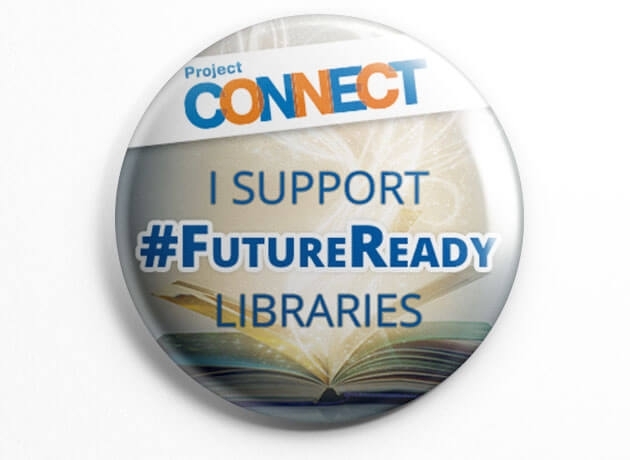 My first concern is how well we, as educators, are preparing students to use technology ethically and responsibly. There are ways to "babysit" the devices but if students are using a school issued device for personal recreation instead of homework, is it effective? "As a mother of four - 2 in high school , a 7th grader and a 5th grader, it’s very challenging to go against the popular current. We held off on giving anyone a device until 9th grade. An old smart phone. Both high schoolers have phones now. Strict rules still apply to the 9th grader. This summer I read Alice Keeler and Matt Miller's Ditch That Homework: Practical Strategies That Make Homework Obsolete. I have both personal and professional reasons to love this idea but what resonated with me were some of the reasons, supported by research, for ditching homework. (Links to research can be found on the Ditch That Textbook web page). Keeler and Miller discuss how homework is not equitable for all students as "home situations, resources and parent time are not equal. Not all kids get the same level of support at home." We send students home with devices assuming they have the ability to access the Internet and some sort of adult guidance. Keeler and Miller also point out that kids who do their homework are typically the ones who do not need the homework because they already understand the topic being reinforced. My ideal school would offer longer classes, at least an hour, where both instruction and student work can occur during the same period. Shorter class periods allow time for one or the other and assume students will remember instruction details from the previous day. Or the shorter class period is rushed as educators try to cram in instruction and rush student work. There is little to no opportunity to work with individual students to address their needs. I speak from personal experience. At the elementary level, I taught 30-40 minute library classes. Teaching digital citizenship or research steps and allowing time for students to work, conferencing and assisting them through their process was near impossible. Oh and I needed to give students ample time to find and check out their library books. And then I would not see them for another week, and by the they have forgotten what we were working on. Co-teaching at the middle school in their 45-ish minute block was not much better as it allows little time for instruction and deep inquiry during the same block of time. Some in education may argue that devices are just like a textbook. We are giving students a tool to learn and do their work, and their homework. But the two could not be more different. Again, do not misunderstand, I LOVE technology but you cannot use a text book to cyberbully, game, or search for clearly inappropriate content. Just as you cannot use a textbook to create digital projects. Adolescents are impulsive and curious, which is not dangerous with a textbook but can be with technology if students are not prepared to accept responsibility and are committed to ethically and responsibly using. My son is only in Kindergarten so I surveyed some parents about their school issued devices. Some stated they liked the seamless transition between home and school work. One parent with multiple children liked that her kids were not fighting for use of their home computer. As for drawbacks, some parents found the device poor quality. Others did not like the responsibility of the device as they are not made to withstand the schlepping in backpacks between home and school. Some schools do not allow students to carry backpacks to class so during the school day they are are carrying them and plopping them with their piles of books in each class, the cafeteria and the gym. The cost of repair was another drawback although some schools do offer insurance. Another parent expressed concern about classroom management and academic integrity. "I don't think the teachers can control what the students are watching/doing when they're up in front of the class teaching and the students are face down in their laptops with the laptop lid facing the teacher. I believe the students should be looking up at the teacher and the board. I know the kids message and video chat ALL DAY LONG. They (school officials) try to block the programs and the kids bypass the blocks faster than they can come up with new ones. I think there's something to be said for pen to paper. Many students are just cutting and pasting what they've found somewhere on the internet for their assignments." Which leads to another point, do school issued devices increase cheating and plagiarizing? How is academic integrity being taught across grade levels? I believe there needs to be more conversations among all stakeholders about best practices and the use of school-issued digital devices at home and at school. Personally, I believe before high school, the norm should be that students leave devices at school where they are safe, can be charged and ready for the next day of learning. 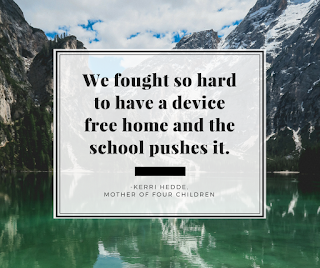 When home use is needed, there should be a specific educational purpose for bringing devices home and parents and guardians should be notified. Make Homework Obsolete. Dave Burgess Consulting, 2017.